The aim of our study was the characterization of anti-cytoplasmic antibodies by home-made morphological and biochemical techniques. Indeed, indirect immunofluorescence (IIF) on HEp-2 cell line is not always exhaustive in relation to the complexity of the antigens involved. 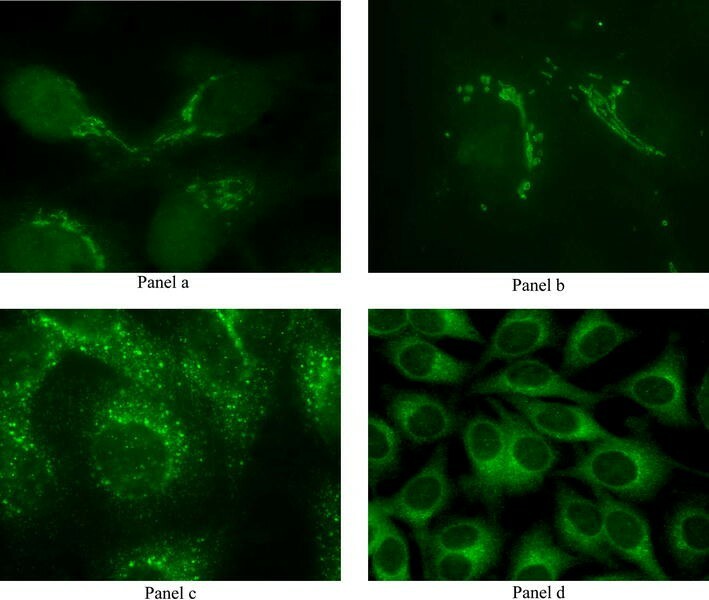 Nine serum samples with anti-cytoplasmic antibodies (2 anti-Golgi apparatus, 3 with diffuse pattern and 4 with lysosome/endosome-like pattern) were tested with fluorescent confocal microscopy, Western blot analysis and, when necessary, with electron microscopy technique. Confirmation of the IIF staining pattern was performed in confocal microscopy by comparison with the respective antibody marker. The anti-endoplasmatic reticulum positivity was also confirmed by electron microscopy evaluation. Both anti-lysosome/endosome and anti-endoplasmatic reticulum positivity have been definitely identified by Western blot through clear reactivity with calreticulin and LC3B, respectively. These results do not aim at representing a standard routine laboratory procedure. Electron microscopy evaluation cannot be proposed as a routine approach, but confocal microscopy technique may be offered in centralized reference laboratories. Newer technologies, especially multiplex immunoassay, can also lead to an easier identification of these autoantibodies, without recurring to a home-made immunoblotting. Only with a complete characterization we will be able to define the clinical relevance of anti-cytoplasmic antibodies, which are still considered as “esoteric” and not as “diagnostic” antibodies. 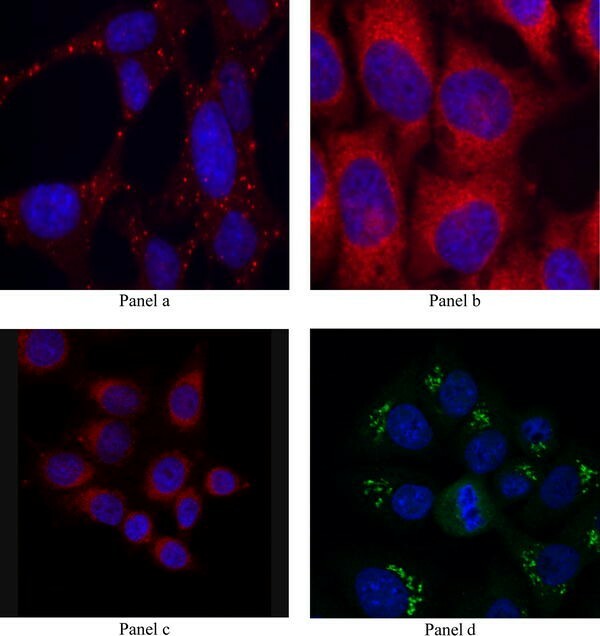 The indirect immunofluorescence (IIF) technique with HEp-2 cells as substrate is the reference method for anti-nuclear antibodies (ANA) detection. This method can identify both nuclear and cytoplasmic staining pattern. Historically, nuclear positivity gained more relevance, but in the last decade, cytoplasmic reactions have also been the focus of scientists and clinicians. Recently Wiik et al. have stressed the necessity of an unequivocal description and nomenclature for anti-cytoplasmic antibodies. The taxonomy of cytoplasmic patterns includes: diffuse, fine speckled, mitochondrial-like, lysosomal-like, Golgi-like, contact protein and vimentin-like staining pattern. Thus, at present, morphology on HEp-2 cell line on the basis of different subcellular localization and details of immune reactions are the most used diagnostic instrument and we have currently no guidelines concerning additional laboratory testing for identification of target molecules of cytoplasmic autoantibodies (AAb). These antibodies react either with a visual recognizable subcellular structure or with defined and undefined antigens. Although their frequency is not rare, being reported up to 21 % of total cases in a diagnostic laboratory setting [2–5], these antibodies do not have a defined clinical value and hence they are often considered as a category of “esoteric antibodies”. Currently, most of the cytoplasmic antigens are known as regards molecular weight and structure, but their characterizations are not routinely performed. This study aims at a better characterization of some cytoplasmic patterns by home-made advanced morphological and biochemical techniques. Nine serum samples from different patients (4 women, mean age 51.8 years, range 38–62; 5 men, mean age 57.6 years, range 45–67) were selected at the Clinical Laboratory at Foundation IRCCS Policlinico San Matteo, Pavia, Italy. All samples were negative for anti-extractable nuclear antigens antibodies and positive only for anti-cytoplasmic antibodies. For the first evaluation, we used commercially available human HEp-2 cells methods (Immunoconcepts, Sacramento, CA; Euroimmun Medizinische Labordiagnostika AG, Luebeck, Germany; INOVA Diagnostics Inc. Werfen Group, San Diego, CA, USA); FITC-conjugated rabbit anti-human IgG was used as secondary antibody. Incubation, washing steps and mounting of microscope slides were done using standard protocols. For confirmatory techniques, human HEp-2 cells (carcinoma tissue from the larynx, ATCC) were cultured into 75 cm2 home-made flasks in Dulbecco’s minimal essential medium supplemented with 10 % fetal bovine serum, 1 % glutamine, 100 units penicillin and streptomycin (Celbio) in a 5 % CO2 humidified atmosphere. 24 h before experiments, cells were seeded on glass coverslips for fluorescence microscopy. All sera were diluted 1:80 with phosphate-buffered saline (PBS). An Olympus LED fluorescence microscope CX41 with filters for activation/emission of fluorescein isothiocyanate (FITC) was used; UIS (Universal Infinity System) optical system, objective Plan Achromat (FN22) 10×, 20×, 40× and 100×. Fluorescence confocal microscopy: confocal laser scanning microscopy, Leica TCS-SP system (Leica) mounted on a Leica DMIRBE-inverted microscope was used. For fluorescence excitation, an Ar/UV laser at 364 nm was used for Hoechst 33258, an Ar/Vis laser at 488 nm was used for FITC and an He/Ne laser at 543 nm was used for Alexa 594. Spaced (0.5 μm) optical sections were recorded using a 63× oil immersion objective. Images were collected in the 1,024 × 1,024 pixel format, stored on a magnetic mass memory and processed by Leica confocal software. Primary antibodies (patient’s sera) and secondary antibodies were used at 1:200 dilution in PBS. Secondary antibodies: Alexa 594 + 488 conjugated anti-human (Molecolar Probe) for anti-Golgi apparatus and Alexa 594 conjugated anti-human (Molecolar Probe) red fluorescence for anti-endoplasmatic reticulum and anti-lysosome/endosome positivity. The nuclei were stained with Hoechst 33258 (blue fluorescence). For ultrastructural cytochemistry, the cells were fixed in suspension with 2 % p-formaldehyde containing 0.2 % glutaraldehyde in D-MEM medium for 1 h at 4 °C. The samples were then centrifuged and embedded in 2 % agarose. Small fragments were dehydrated in ethanol and finally embedded in LR White resin. After preincubation with normal goat serum (1:100 dilution in PBS, pH 7.4 for 3 min), the grids were incubated overnight with sera containing antibodies anti-endoplasmic reticulum (ER) diluted in PBS containing 0.05 % of Tween 20 and 0.1 % of bovine serum albumin, then revealed by gold-conjugated secondary antibodies for 30 min; all incubations were performed at 23 °C. As a control of the specificity of the reactions, some grids were processed in the absence of the primary antibody. All sera incorporation was detected using the gold-conjugated goat anti-human antibody (Jackson Immuno Research Laboratories, West Grove, PA, USA). The sections were examined and photographed under a Zeiss TEM 900 at 80 kV. After treatment, cells were washed twice with PBS and resuspended in lysis buffer (Tris HCl 1 M pH 7.6, EDTA 0.5 M pH 8, NaCl 5 M, NP40 Nonidet 100 %, H2Od with the addition of proteases and phosphatases inhibitors) at 4 °C for 20 min. Bradford reagent (Sigma Aldrich, Italy) was used for the count of protein amount. Samples were electrophoresed in a 12 % SDS-PAGE minigel and transferred onto a nitrocellulose membrane (BioRad, Hercules, CA, USA) by a semidry blotting for 1.45 h under a constant current of 70 mA. The membranes were saturated overnight with PBS containing 0.2 % Tween-20 and 5 % skim milk, and incubated for 1 h with patient’s sera and commercial primary antibodies. Commercial primary antibodies used in the study were anti-Calnexin-ER membrane marker antibody [6F12BE10] (ab112995), LC3B (microtubule-associated protein 1 light chain-3B) and ab63817-2 ABcam. After several washings, the membranes were incubated for 30 min with the proper secondary antibodies conjugated with horseradish peroxidase (Dako, Milan, Italy). The visualization of immunoreactive bands was performed by an ECL System and Hyperfilm Photographic Film (Amersham Life Sciences, Little Chalfont, UK) using the manufacturer’s instructions. The fluoroscopic patterns of the tested sera are summarized in Table 1 and Fig. 1a–d. The framework of the fluoroscopic test sera was confirmed on home-made HEp-2 cells in confocal microscopy by comparison with the respective markers. The confirmation of the staining pattern of the Golgi apparatus, endoplasmatic reticulum or lysosomes/endosomes was performed using antibodies to determine if they co-localize with the same cytoplasmatic structure that the human antibodies do (Fig. 2a–d). The positivity for anti-endoplasmatic reticulum antibodies was also confirmed in electron microscopy on a section of rat pancreas using the gold-conjugated goat anti-human antibody (Fig. 3a, b). The tested antibodies have been definitely identified by Western blot on home-made HEp-2 cell extract. Results are summarized, respectively, in Fig. 4 for anti-endoplasmatic reticulum and in Fig. 5 for lysosomes/endosomes. All anti-endoplasmatic reticulum positive sera reacted with calreticulin; only some of them showed a weak reactivity with calnexin and/or PDI molecular fraction. Among anti-lysosomes/endosomes positive sera, all samples showed a clear reactivity with LC3B and a weak reactivity with Cathepsin L, LAMP-2 and GRASP-1 antigens (Tables 2, 3). The results described above do not aim to represent a standard laboratory routine procedure, but to reproduce the methodological approach for a complete characterization of cytoplasmic antibodies. Electron microscopy technique unambiguously detects cellular target of antibody reaction and the Western blot technique leads to a definitive biochemical identification. Different cytoplasmic antibodies can produce a similar IIF staining pattern; immunoelectron microscopy and colocalization studies using antibody marker can identify the subcellular localization in which the antigen involved is present. When the reaction for a specific cellular compartment is confirmed, the choice of which antigens should be tested by WB or other techniques become easier. Indeed, for most of the cytoplasmic positivities, we know the main antigens target and commercial specific purified proteins and monoclonal antibodies are available. In our study, we used anti-calnexin and LC3B antibodies for the recognition of endoplasmic reticulum and lysosomes/endosome involvement, respectively. Not only some of these antibodies appear quite similar by routine IIF, but also they are often seen in association with other antibodies and in these cases, the contribution of other technologies can be useful. For example, anti-Golgi apparatus antibodies can be associated with the 52-kDa SSA/Ro specificity . Although for anti-Golgi apparatus positivity, IIF staining alone may be sufficient for morphological detection, samples presenting a diffuse cytoplasmic pattern require further investigations. In our study, electron microscopy technique clearly identified the reactivity for endoplasmic reticulum. Among endoplasmic reticulum (ER)-resident chaperones, the immunoglobulin heavy chain binding protein (BiP), glucose regulated protein 94 (Grp 94) and calnexin/calreticulin, were studied in various autoimmune disorders. Recent studies identify calnexin and Grp 94 as novel autoantigens in RA and calnexin in systemic lupus erythematosus (SLE) . The chaperones prevent irreversible aggregation of protein under physiological and stress condition; they are involved in antigen recognition and presentation and they also ensure the proper folding and quality control of newly synthesized glycoproteins . In our examined sera, the most evident reactivity was with calreticulin. Golgi complex autoantigens are a family of proteins referred as golgins. The majority of these molecules project into the cytosol except giantin/macrogolgin, which has a trans-membrane domain . Anti-Golgi antibodies (AGAs) are various, some of which are well characterized on the basis of molecular weight (golgin 67, 95, 97, 160, 245, 376 kDa). Nevertheless, a great number of them remain unknown. AAb to giantin/macroglogin (the highest molecular weight golgin) were the most common antigen recognized in AGAs sera (50 %); the second common target was golgin 245 and the last one was golgin 97 [9, 10]. Thus, the reactivity seems to numerically correlate with the molecular mass of the native Golgi antigens; distinct molecules with different conformational and sequential epitope are involved. Available studies concerning AGAs were reported mainly from sera of patients with autoimmune diseases, especially Sjögren Syndrome (SjS), rheumatoid arthritis (RA) and SLE, but AGAs occur also in non-autoimmune disorders. Some Golgi antigens were described in association with a specific disease, e.g., golgins 64, 95, 160 to SLE and 79 to RA . Other antigens are present in non-autoimmune diseases as HCV and HBV hepatitis. Only immunoblotting and immunoprecipitation analyses can be useful to distinguish among different AGAs-associated diseases. Indeed, recently, a retrospective study conducted only on the basis of specific-staining pattern by IIF concluded that AGAs are not clinically associated with systemic autoimmune disorders . In our previous studies [13, 14], we have already characterized AGAs positivity with combined use of morphological and WB techniques; the same strategy has now been applied to different anti-cytoplasmic antibodies. Also the anti-endosome/lysosome-like pattern could be better defined through confocal microscopy and WB evaluation in the present study. The examined sera showed a homogeneous profile of immunoreactivity. The reactivity reached its maximum with the LC3B marker, but there was also an immunostaining corresponding to the known molecular weight described for Cathepsin L, LAMP2 and GRASP-1 antigens. The 12 % SDS polyacrylamide gel could not detect the reactivity with early endosome antigen 1 (EEA1) at molecular weight >130 kDa. However, our primary aim was the identification of the cellular compartment involved in antibody’s reaction; this means that we did not aim at identifying all the antigens described. Anti-EEA1 antibodies are seen in patients with neurological diseases and quantitated using an addressable laser bead immunoassay on Luminex platform ; anti-LAMP2 antibodies have been also recently studied in ANCA associated vasculitis . Overall, the increasing interest for these “minor” autoantibodies may lead to the development of easier and more practicable methods for their detection. In conclusion, electron microscopy evaluation cannot be proposed as a routine approach, but the confocal microscopy technique may be offered in centralized reference laboratories and can thus be considered as a more affordable practice. The continuous development of AAb assay can facilitate the routine detection of anti-cytoplasmic antibodies without recurring to a home-made immunoblotting. Line/dot immunoassay and newer technology (especially multiplex immunoassay) are the future way for an easy identification of these antibodies in clinical laboratory. Relatively low frequency and incomplete characterization of anti-cytoplasmic antibodies hinder the studies of their clinical relevance; only on the basis of these evidences these autoantibodies will be considered as “diagnostic” and not as “esoteric” antibodies.